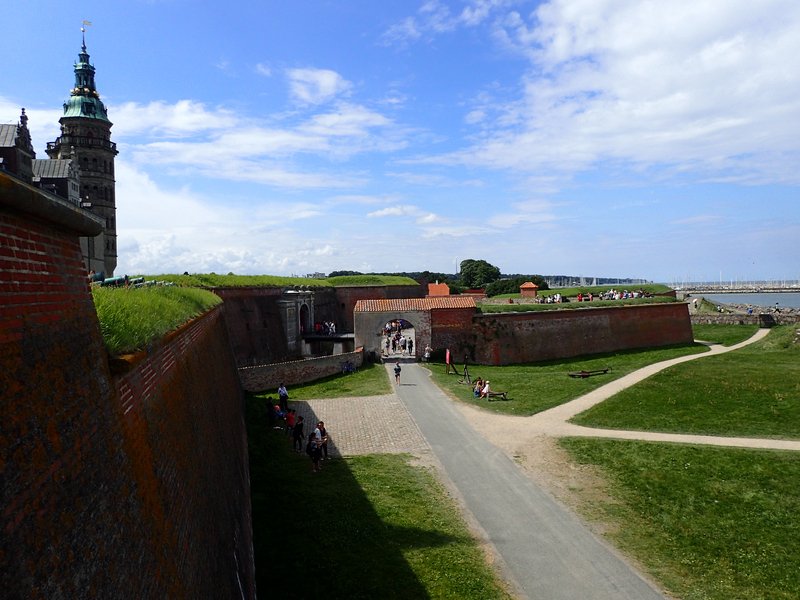 “If you can, stay a night in Helsingborg and cross over to Denmark to see Hamlet’s castle.” This came as advice from a friend about how to use my limited time in southwest Sweden. With a BFA in theatre who once had the nerdy high school habit of reading Shakespeare by candlelight, it’s hard to believe that the idea hadn’t occurred to me in the first place. It had been years since I’d read Hamlet and if I’m honest, I’d never thought about the real “Elsinore.” Shakespeare never went there and I’d given zero thought to whether this Danish castle still existed. It does. And it’s impressive. But it’s actually called Kronborg. 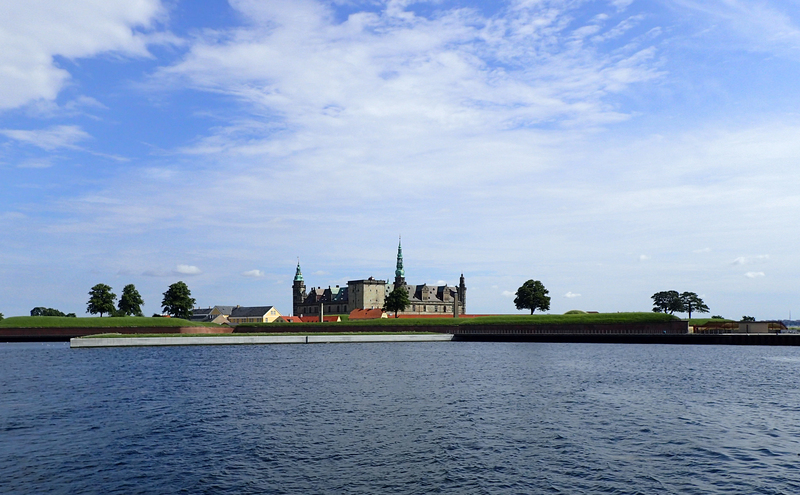 Elsinore is the Anglicized name of the location in which the castle sits, Helsingør. The journey was easy: a short ferry ride from Helsinborg in Sweden to Helsingør in Denmark, walk to the castle, buy a ticket, and explore. 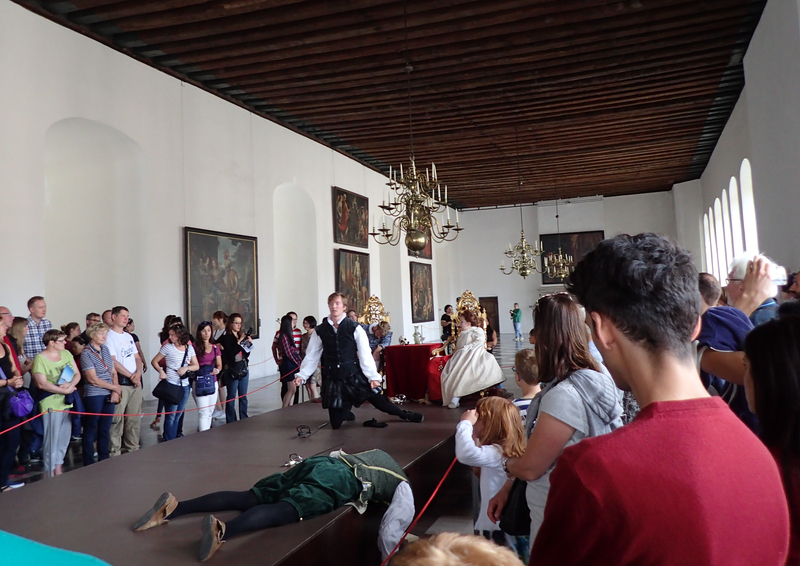 A summer program called “Hamlet Live” was in progress when I visited. Actors staged scenes from Hamlet using contemporary language and taking a few liberties with the plot (I’d re-read the play the night before my visit), popping up in different parts of the castle for different scenes. At times, an actor would interact with visitors, staying in character as much as the conversations allowed. As I walked through the Queen’s Chamber, I heard Gertrude ask a woman to fill her glass with water from the next room, advising her it was “all very modern” and handing her an empty glass. Sure enough, a somewhat contemporary sink graced the alcove next to the Chamber. Polonius telling Gertrude and Claudius that Hamlet is mad in the king’s chamber. The ballroom and the closing scene of Hamlet, in which a few liberties were taken with the script. A ew touches, perhaps installed for the entertainment of children, perhaps props for the actors, felt out of place. A fake fire of colored paper in one room, a basket of yarn near a window in a small alcove, wooden cut-outs with missing faces where people could pose as Hamlet and Ophelia or Gertrude and Claudius scattered around the grounds. These cut-outs seem to be all the rage in Scandinavian tourist sites so I don’t blame the staff at Kronborg for joining the crowd with those. But the paper fire in a room with no lights and a faint audio recording of a crackling fire just felt silly. 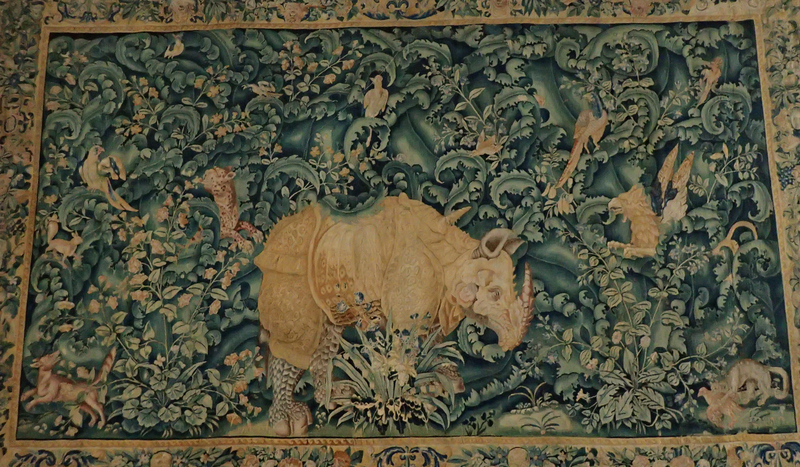 Regardless, it’s a beautiful castle filled with interesting tapestries and furniture. This tapestry was one I didn’t expect in a Scandinavian castle. Two rooms are lined with photos of famous actors who have played the parts of Hamlet, Ophelia, and others during productions of Hamlet at the castle. Laurence Olivier, John Gielgud, Vivien Leigh, Christopher Plummer, Michael Caine, Fay Compton, the list is long. Performances have been held every year in the castle for the last 200 years. I’m kicking myself for not planning ahead on this trip so that I could catch a show this year. A stage had been erected in the courtyard but performances didn’t begin until after I’d left the area. 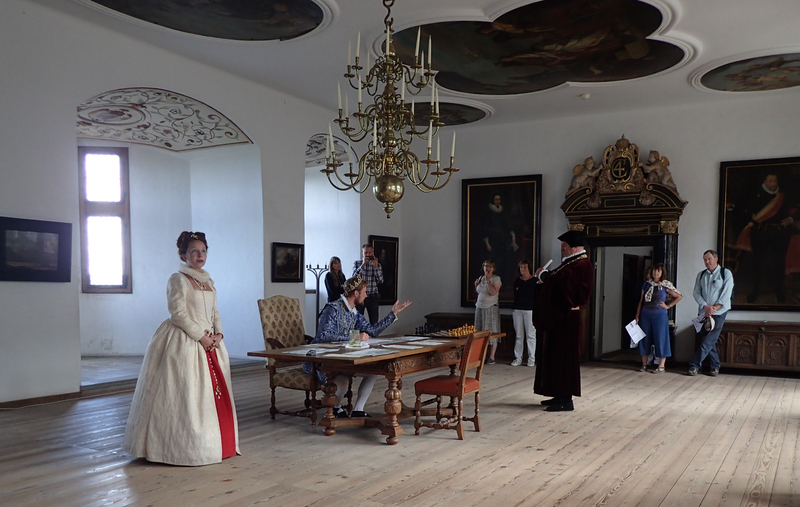 Aside from the Hamlet connection, Kronborg has its own history. Listed as a UNESCO World Heritage Site, the current design of the castle dates to the 1570s when Danish King Frederick II had the former medieval fortress redesigned into a Renaissance castle. From the 1420s, the site had been used to collect tolls from ships traversing the Baltic Sea. The sound between the castle and what is now Sweden is only 4km wide so a similar fortress existed on the east side, ensuring that duties were paid. Today, this is all that’s left of Kärnen, a rebuilt medieval tower that I walked up the day before my visit to Kronborg. 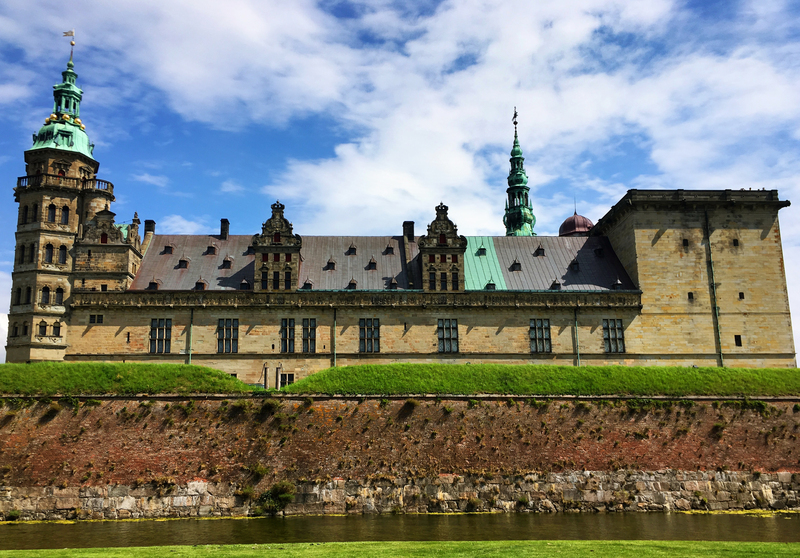 Throughout the years, Kronborg has served as a home to Danish royals, a prison, an army barracks, and a tourist attraction. Legend has it that it’s also home to sleeping king Holger the Dane, a mythical king said to be sleeping until his country is in peril. A television crew and security guards blocked all access to the statue resting in the casements when I visited so sadly I can’t share a photo or attest to whether his hair is sculpted to reach the ground. 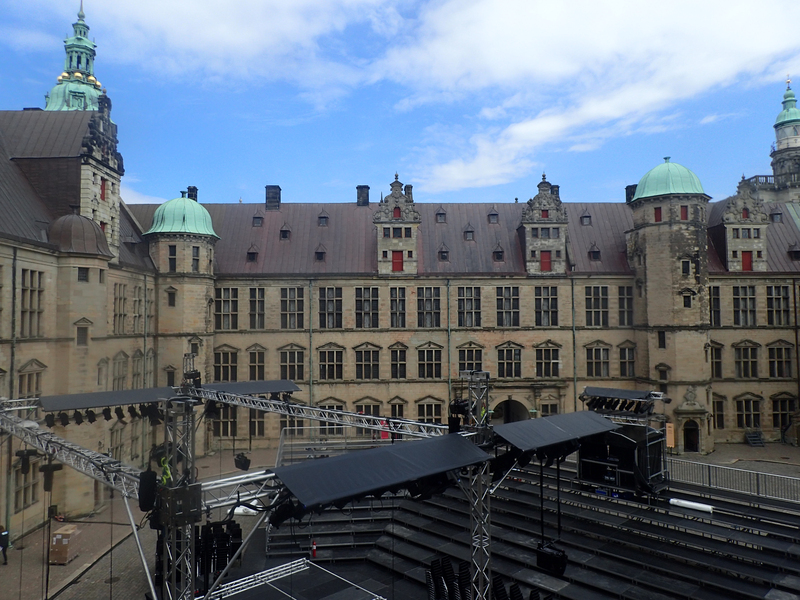 As I wandered the grounds of Kronborg, the words of Shakespeare fresh in my mind from my recent reading of Hamlet, I found myself thinking back to my years in theatre. The performing arts were a thread through my childhood and young adulthood. I grew up taking ballet and theatre classes, routinely attending performances in both. My undergraduate degree is in theatre and for a brief period, I worked in the field. I don’t regret the decision to pursue another career (or two or three) but I do miss the experience of sitting in an audience watching a story unfold on stage through the words and movement of people who are just as present in the space as I am. I’m not sure yet how to incorporate the attendance of live entertainment in my travels with any sort of regularity. Cultural and language barriers are sometimes hurdles and paying for tickets means taking money away from other things. I do know that next time I plan a trip to anywhere in the world that has an obvious connection to Shakespeare, I’ll research in advance so that I catch a show or two! ← Flåmsbana: The most beautiful train journey in the world?